Today's SCS challenge was to use only items that were on a list. See LSC122 - Follow the List # 3. We were tasked to make a get well card WITHOUT ANY FLOWERS! It seems that, yes, it is possible. Here's my card for this challenge. (I just showed my DH my card and he had the utter nerve to ask how a bottle of ketchup was going to make anyone feel better. He's about to find out!) Ladies, that's a bottle of red wine Bella's holding. Anyway, I digress. 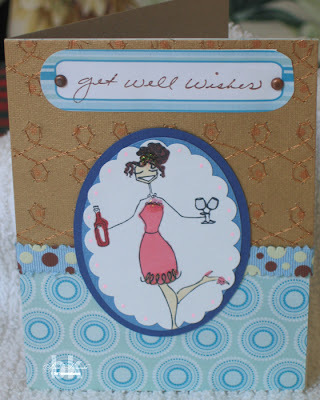 It was a great challenge to make a Get Well card without using any flowers. I had to really think about it and riffle through my papers to come up with something suitable. I hope I succeeded. I am late getting my card done for your Weekly Colour Challenge - part 11. In order to comply with the rules, the background is glossy paper sponged with copper alcohol ink, with a bit of pearl thrown in for good measure (actually, they came as a set, so I thought, what the hay). I also added metal brads for the headlights, some silver stickles to the car Cruiseabella is driving and, to honour the KISS concert you may be attending, I had to use the sentiment you see, signature of Stamping Bella herself, Emily! ...because I need more of the mesh that was on the bottle! As soon as I saw this mesh, I knew it belonged on a card. With incredible haste, I downed the contents of the bottle (hic) and removed the mesh (hic). Then I stumbled into my craft room and laid my head down on the table to think about how to make a card with the mesh (hic). I fell asleep! The good news is that when I woke up, I knew what I wanted to do with the mesh. I took a piece of kraft paper for the card base. I stamped trees onto Very Vanilla and sponged with some chalk inks in several colours. 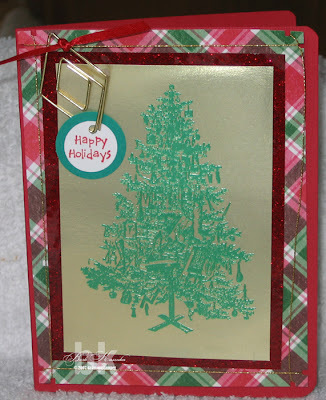 I took the mesh and, using lacing brads, adhered it to the tree stamped piece of cardstock. 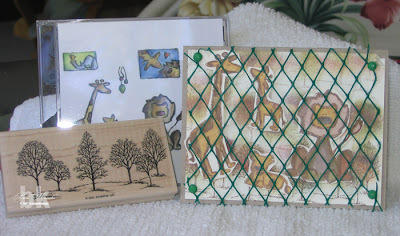 Then I pulled out my jungle stamps and stamped & coloured the lioness and her cub, and the giraffe mama and her baby. After carfeully cutting them out I wanted to place them under the mesh. Why, or why, didn't I think of that before attaching the mesh? I can only believe that the contents of the bottle that held the mesh was the reason!!! However, after much perserverance, the animals were successfully caged and no one was hurt, this time. Don't you just love this card? I really, really do. I used the Think Big set from SU, of course. I've had it for about 6-7 months now, I guess and have always had a difficult time with it. Like all my other stamps, I just had to have it and then was stumped to come up with any original ideas. In addition to this being good for Makeover Monday, it's also my card for the SCS Try a New Technique challenge today. You can see TLC122 here. The challenge today was to make a card that would fit in a business-sized envelope. The dimensions of the card are 9" long x 7.5" wide, folded in half length-wise. 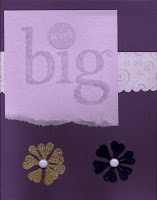 The purple card you see here was my first attempt using Think Big and I think it's a great example of why it needed to be featured on Makeover Monday! I look at it now and it's so lame!!! 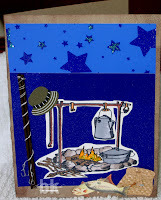 When I made the new card, the piece of DS-DP with the word 'together' on it was in my scrap drawer. I knew right away that I could make it work on a card if I combined it with the 'dream' and 'big' stamps from the set. 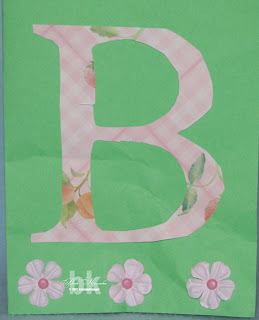 The 'big' is stamped onto vellum using a chalk ink and clear embossing powder. I attached the vellum piece and placed some crystals to cover up the tape, added a few flowers and I'm loving it. In exactly six months from today, it will be Christmas again. Have you got cards started? 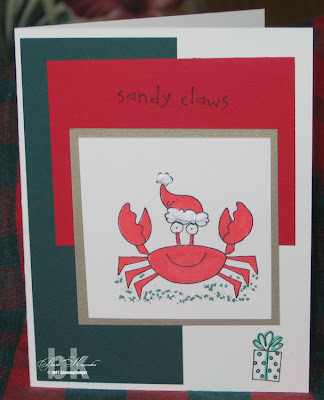 This is my second Christmas card and it's my entry for Beate's Weekend Sketch Challenge #7. I sure hope I make it on time for the drawing. This is the other card I made using the same sketch. I did this yesterday, but I had to wait for it to dry as I had sprayed it with some sparkly paint stuff. Sorry, but yes, that's what I said. Today I made my first Christmas card for this year and, ohhhh, it felt so good! It came about as a result of the Challenge #16 over at Captain Crafter. We were to use three different colours for the card, but they could not be used as the base. So, while rifling through ALL of the SU colours which I now have, I pulled out two that were definately Christmassy. The third just jumped into my hands while I was holding the other two. And this card was born. I distinctly recall stating in a previous post that I love this set and you would be seeing it over and over and over again. I kept that promise. Don't you just love Christmas. Now that I'm thinking along those lines, I may just make about six different cards and send them to my daughter and my son to take into their workplaces to see if I can drum up some business. When it gets really, really hot in July and August, I'll be cool making Christmas cards. 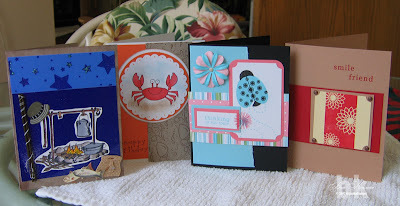 I'm slowing down a little -- only a dozen cards today! I needed to take a little rest after yesterday's marathon, but what's a Grandma to do? My daughter called to tell me all about her vacation in Spain and we got to talking about Owen and what he's up to these days, you know, the usual Grandma stuff to make me smile. Just before they left on vacation Owen was Christened and had his 1st birthday party. I asked if she wanted me to make thank you cards as I had been inspired by a card in the current issue of Stamp It! cards (pg 71). So I hurried and made a dozen today and they're in the mail to England already. It actually didn't take very long as I had an assembly line going and I was done in about 2.5 hours. Thank you to Wendy Gallamore whose card I CASED, with just a couple of changes. Accessories: Prismacolor Markers, brads, CM round punches - 1-1/4" and 1-1/2"
AND WHAT DID YOU DO THIS MORNING! 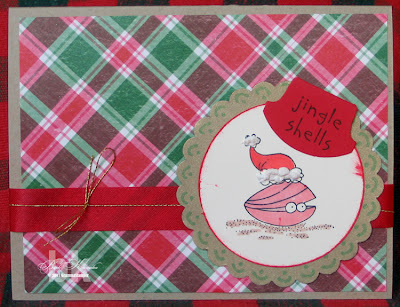 This lovely card was made for a Virtual Swap at The Stamp Shack. Debbie sent out pre-stamped images to about 10 people and we each did a card and posted it in the gallery. 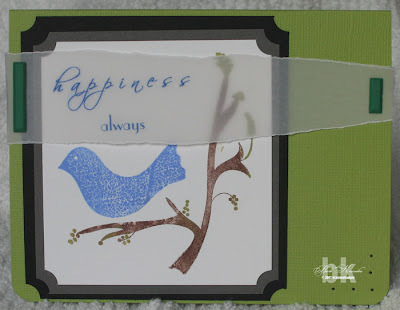 This is a wonderful way to see how to use a stamp when the idea just doesn't come to you easily. Send it to others and see their interpretations. And, best of all, NO POSTAGE! Next up is Crabby Guy! 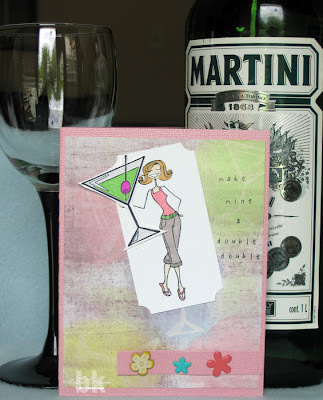 This card was made for the sketch challenge at SCS, SC129. I just received my SU order yesterday and now have all cardstock in each colour family, plus Kraft paper, Very Vanilla and Cool Caribbean. 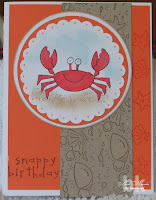 Also in there was Crab & Co. stamp set and the spiral punch. I love, love, love Crabby Guy! I'm sure you will see him fairly frequently, even Christmas! Anyhoo, this was for the sketch challenge from Wednesday. The third card from the left, was made for Poetic Artistry and the Bingo game going on. Each time someone posts a card, Julee adds another number. This is my contribution. Besides, my Papertrey Ink stamps also arrived yesterday and I had to play with those, too! Man, I didn't even get showered and dressed until 1:00 p.m. today, I was so busy playing. Getting old is great 'cause I get my second childhood early! 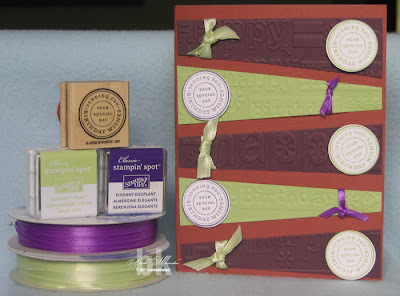 My Papertrey Ink order was Text Boxed, Lady Bug and Faux Ribbon. I was almost caught up until I read on Nichole's blog that they will be releasing FIVE new sets in July. C'mon, give the bank book a break! Can't wait until the 15th of July! The last card on the right is also combining two challenges; Kerry's Sketch 28 and CC119 at SCS. So, for Kerry's sketch I used Creamy Caramel, Real Red and Barely Banana. I'm so glad to have ALL the colours now, I can't tell you! Although you can't really see it, the Real Red strip has been stamped with Real Red ink and, of course, the stamp set is Text Boxed from Papertrey Ink. It's a very simple card but I like the clean look of it. OMG! I think this is the largest post I've ever made and my fingers are worn to the bone. However will I stamp tomorrow! It won't be easy, but stamp I will. Thanks for checking in and have a wonderful day/evening. Be back soon! I don't like Bingo, at least I didn't like it when I was younger, but I learned something about myself last night. Attach Bingo to a card sketch and I'm in, baby! All the way! What has happened to me? I can't seem to pass up a card sketch lately, or any type of challenge, for that matter. Colour challenges, limites supplies challenges, new technique challenges.....nothing gets me going more than a challenge. Now BINGO! You see, over at Poetic Artistry, Julee has a bingo game going. Easy enough, right? However, if you want more than one number per day called out, simply complete the sketch card and let her know you've done it. For every person that enters a card based on that sketch, Julee will add a number. This card is my entry. I had it done last night, but had to wait for the Stickles to dry before I could upload it. Now I'm off to let Julee know to add another to her list. This is a great game, thanks Julee. 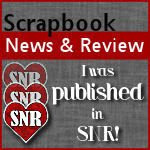 While working away on the SCS Featured Stamper on Sunday past, I took a look at the FS' blog known as Captain Crafter. This is the first weekend he has opened up his sketch challenges to everyone who wishes to participate. Well, I wished and this is my card. As soon as I saw the sketch, I knew exactly what I wanted to do as I had this really wide ribbon that I didn't know what to do with. Well, this works just great and I like the end result, too, including the sentiment. 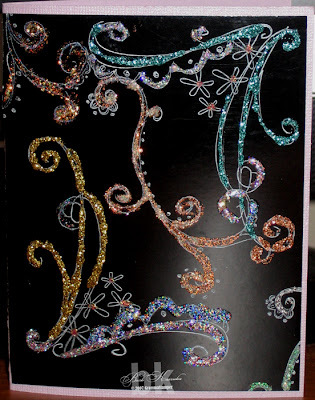 After selecting the card base, I added some reversible patterned paper. I went with the plain side for the card face, cut a strip from the right side of the card front and added the more patterned side for contrast. I turned up the bottom left corner, fastened with a brad and stamped a little paw on the corner to tie it altogether. 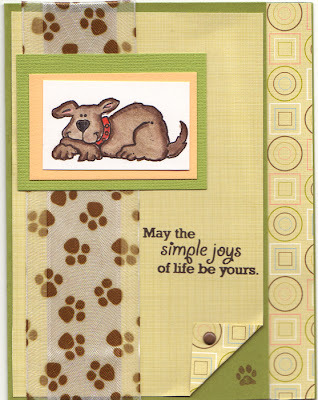 Today Tami's challenge for Dapple Designs Color Challenge ~ part 10 was to use only one colour and make a monochromatic card. At first I thought this was going to be really difficult, but while wading through the piles and piles of cardstock and paper on hand, I realized that I have 27 shades of blue, so no problem with this one. Did you know that some shades in the same colour family actually clash? I didn't know that until today! Because blue was my choice, it just cried out for a Christmas card, so here it is. I can't believe it's that time again. Okay, here it goes! This card was made for a Technique Swap. 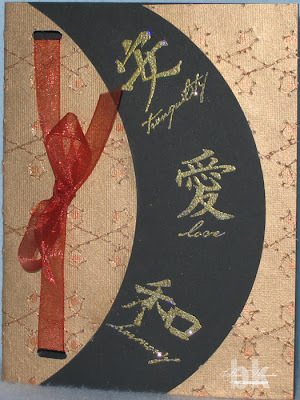 As you can see, I used gold paper and gold embossing powder for the main image and red embossing powder for the sentiment. I just thought it was the 'cat's pajamas'. Except for the fact I no longer have the stamp for the main image, this is what I would do today. As you can see, I turned it into a Christmas card. The original card above had no layering whatsoever. Today, I can see the benefit of layering a patterned paper on the original cardstock, then stamping the image on another layer because it is far more appealing to the eye. Adding the gold thread around the image just keeps your eye moving around the card. The one thing that I know I still need to work on is getting the damn thing straight. This is quite a challenge for me and if anyone has a tried and true method of lining things up, please share it here. I've had many readers say how much they like Makeover Monday's and I appreciate your comments. And now, I'm off to Dapple Designs for Tami's colour challenge, then a bit more blog hopping in search of challenges of any kind. It's a good thing I'm not driving, eh? Today's Featured Stamper over at SCS is Greg aka Captain CRAFTER aka Pure-Genius. Click on the high-lighted word to see the card I chose to CASE! Greg also has his own blog which you can see here. I'll be visiting there more frequently, especially to do the challenges he will be providing weekly. These challenges are great and I so appreciate being able to participate. Supplies: Bazzill, SU cardstock, Vellum, Nature Stamps by Autumn Leaves, Ballet Blue ink, ColorBox Fluid Chalk inks in green & brown, bar brads. Oh how I love the sketch challenges and I'm so greatful there are so many around. They keep me playing for hours and hours! 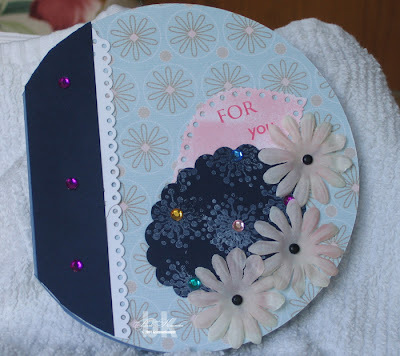 This circular card is my submission for Beate's blog sketch challenge #6. Thanks, Beate. Here's a little bit of fun for you. Give it a try! Two more challenges completed today! This card was created for SC128 which you can see here. I have had a very difficult time with this sketch because I've always believed myself to be 'math challenged' and when you start throwing mitred corners around, well, YIKES! I just go blank and think I can't do it. Well, after many tries, here is the card. It took me almost two days to make it. I like it well enough, but in retrospect, I would have rather just put a simple 'hello' on the bottom middle panel instead of using the circle 'thinking of you' stamp. The background was made using Alcohol Inks on black glossy cardstock. I made this card for WT117, shown here. The Ways to Use It called only for 'Fabulous Flourishes' today. Since I do have the best-ever stamp set for flourishes I just had to do it. Again, I used the glossy black c/s. 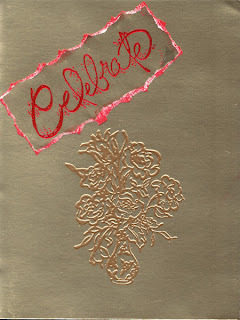 I stamped the flourishes with White Brilliance Ink and then lathered on the Stickles in every colour I own. May be over the top with the Stickles, but who doesn't love glitz?! This card is a result of a sketch drawn by a 5-yr old girl, Meg! She is the daughter of one of the members at The Stamp Shack and she also has her own blog, Whirlpool of Imagination, where she posted the sketch. You can see it here. Meg, here is a card I made using your sketch. It was fun to do and I hope you like it. I don't know why, but in my mind, I call you Meggie. I hope that's okay. And here I thought I didn't know how to recycle stuff I usually throw out! 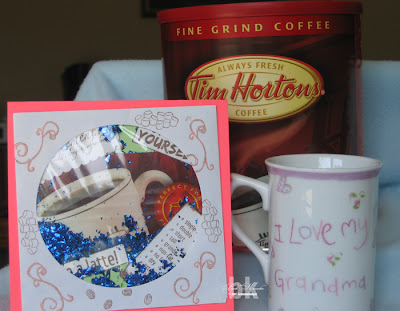 Look closely at this card and you will see that the background is the label from a large can of Tim Horton's Coffee. It is a shaker card made using the tutorial found here. This is my first try and now I will know next time to place the bits and pieces a little better and to use less confetti! The damn stuff all but blocks out the main image. Both of these cards were for a 'virtual swap' that we do over at The Stamp Shack. Someone will post an image they would like to see how other people use. Then, the members who are interested leave their name and the originator of the 'virtual swap' will send the images out. 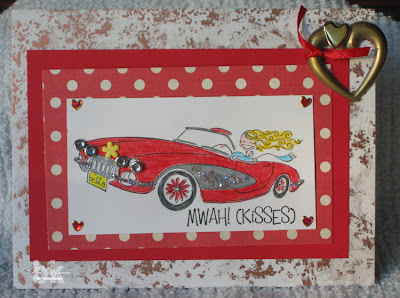 We make our cards and post them in a special gallery set up for just Virtual Swaps. It's a great way to swap without having to either pay postage (except for the person sending out the images in the first place), or wait for cards to be received. I thoroughly enjoy doing it that way. Kerry sent us images of coffee related things and it took me a while to figure out what to do with them. Last night, as I was tidying up the kitchen, I saw an empty can of Tim Horton's waiting to go out to the recycle bin. I thought, I could use that label on a card and the rest is history! I love my Timmy's coffee and hope they enjoy seeing their labels on my cards. To my American friends, if you don't know about Timmy's, as we so affectionately refer to our local coffee shop, they are Canada's answer to Kristy Kreme, I guess. The coffee is superb, shop is always clean and the coffee, doughnuts, sandwiches, goodies and the like are reasonably priced. If you click on the pics, you will see a larger picture which will open in new window (I think!). This creation will serve to be my entry for two challenges. The colours pink, rose and copper, were to meet the requirements for Colour Challenge Monday ~ part 9 on Dapple Designs. I must say that I think Tami's choice of colours is just stunning. Thank you, Tami. 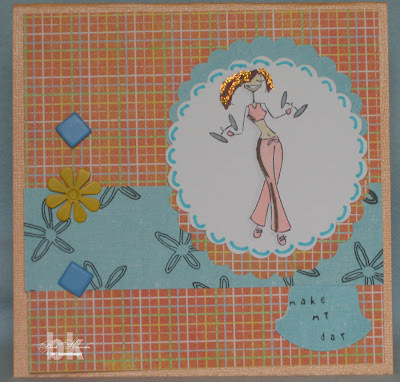 The design for this Gatefold card is from Beate's fresh and fun, for Weekend Sketch Challenge # 5. I love this design and it was made that much easier because my new Scor-Pal arrived in the mail yesterday. This tool is going to become a mandatory, must have tool for every cardmaker out there, trust me! I can't wait to use it again so stay tuned. Thanks, Beate, for a wonderful sketch challenge. I hope you are enjoying your holiday! 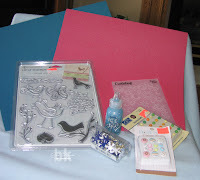 You may have read a previous post telling you that I had won a $50 GC to Scrappin' Great Deals offered as blog candy on Stampin' When I Can. Well I shopped on Thursday, and the goodies arrived yesterday. You could have knocked me over with a feather (no small feat I can tell you). Somebody must have lit a firecracker under Canada Post. I digress, sorry! Here's a picture of the goodies, sans a couple of items that will follow soon. 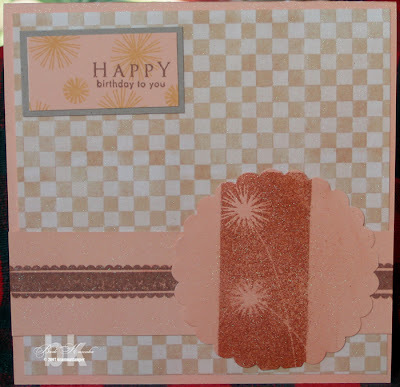 Missing are embossing folder Spots & Dots and some brads in soft summery colours. Thanks to Sheila for such terrifically fast service. I love all the stuff. I did actually spend a little more than the GC, but what the hay, I'm happy! Again, clicking on the picture will give you a better view of the goodies. A very special thank you to Allison. When my son, Phil, became engaged to his lovely lady, Kristyn, the card on the right is the one I made to congratulate them. That was in February 2006. I thought it was a wonderful card with the right edge cut with fancy scissors. Oh, and let's not forget that great sheet of pink c/s that came pre-embossed. Oh my, and the rounded corners were just to die for! And, the stamp set I used was one of my first-ever SU sets purchased during the Sell-A-Bration offer. Today, now that I have honed my skills (LOL! ), I think this is the card I would make. I still have a fancy edge made with the slit punch. The DP was used to stamp the flowers, then I cut them out and put them together with a brad. Next, I folded up the petals to give it some dimension. Stickles, the mainstay of my craft supplies, was used liberally, in several different colours to give it some glitz. Because so much was going on, I only had room for the little "Congratulations" stamp in the corner. I showed it to DH and his first comment was, "That needs a box, you can't put that in an envelope." He's always so practical. How can you think of shipping it when a thing of beauty is staring you in the face? I do believe he has seen the error of his ways now, though! Today was Inspiration day at SCS. We were to draw our inspiration from this picture. OMG! I thought I'll never come up with anything. My mind must have been working on it while DH and I watched a movie this afternoon because when I went to my craft room, this card was completed in about 15 minutes. I'm signing off now to go buy a lottery ticket. See you tomorrow! I'm so sorry that I don't have the correct challenge title for this post. SCS website is 'down' at the moment, but as soon as I can, I will edit this post to show the challenge properly. The challenge is LS119 ~ Create A Background, as corrected in the title of this post. In the meantime, I do remember that is was for inked backgrounds which did not include things like large stamps, cuttlebugged papers, etc. I sure hope using small stamps and a brayer wasn't included or I'm in deep doo-doo! I had to make this Cosmobella card because of something I saw over at The Stamp Shack. 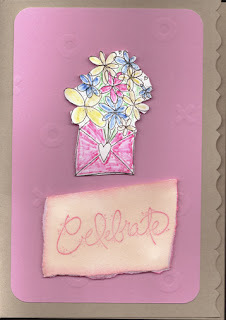 My friend Sherri, was playing around and posted a card with Cosmobella with a huge cupcake. I just loved the idea and decided to 'borrow' it from her. I hope the link will work for you! Anyway, that's how the idea for this card was born. 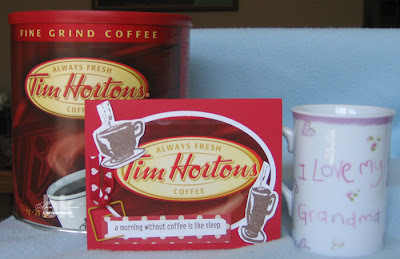 In case you can't read the stamped sentiment, it says, "make mine a double double". Okay, I'm really laughing to myself, I thought it was pure genius! Also, I knew I wanted to 'stage' this photo because of the content. I went to the liquor cabinet to get the Martini bottle, went to the cupboard to get a martini glass, but couldn't reach it. I even got out the step-stool. I was able to get onto the first step, but my crappy knees wouldn't let me get my foot on the second step, so I had to use a wine glass. Please forgive the faux paux! Besides, if DH had seen me trying to climb up for a picture, I wouldn't need my knees replaced, he would have killed me! Not really, but he would not have been happy with me for sure. Hey, Sherri, this one's for you! I have never before used chipboard. I know, I'm way behind everybody else, but that's nothing new! So today I pulled out a couple of packages of chipboard my DD picked up when she was visiting friends in San Francisco. I looked at the photo corners, I looked at the circles, kept looking at them until something came to me! Duh, like an idea! I've never realized how fast time moves when staring at photo corners and circles! It's amazing, really. Well, I chose the circles and I'll tell you why, even if you don't want to know. It has colours that I need to complete Colour Challenge #8 at Dapple Designs. The colours called for were moss, chocolate and apricot; a gorgeous combination. Tami, this is my card made for you. I hope you like it. I find simplicity sometimes makes for the nicest cards. I'm sure everyone will recognize the stamps, but if not, there's the supplies listed at the bottom. Keep these challenges coming, Tami, I really love them. Stamps: Green Thumb by Papertrey Inc. Even though Grandma and Papa John can't be with you on your very 1st birthday, we want you to know that we love you very much. We hope you have a very, very happy birthday and get lots of pressies. 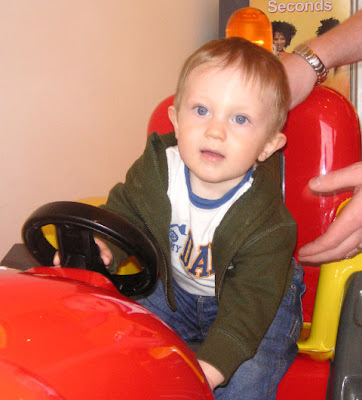 So, to all who may stop by here today, please wish Owen a happy birthday. I will be printing the comments and putting them in a scrapbook for him and I think this would make a wonderful keepsake. 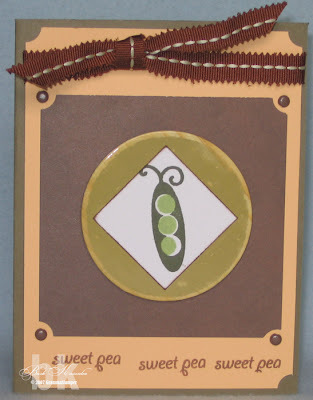 This is a card I made for the Weekly Challenge at The Stamp Shack. 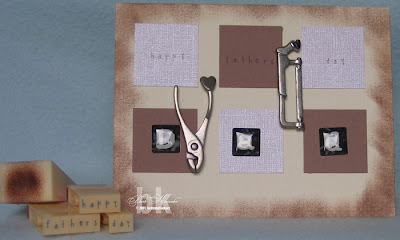 There are two challenges combined: a colour challenge using chocolate brown, white/ivory and pale purple and we were challenged to make a Father's Day card also. The squares were punched using my CM 1-1/4" punch. I was going to stamp kitty paw prints around the edges and give it to DH because we don't have any kids at home now, just a cat, Hank, who demands as much attention as a 2-year old child. LOL! 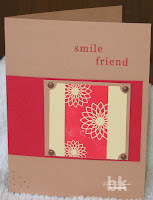 This card is for SCS colour challenge CC117. 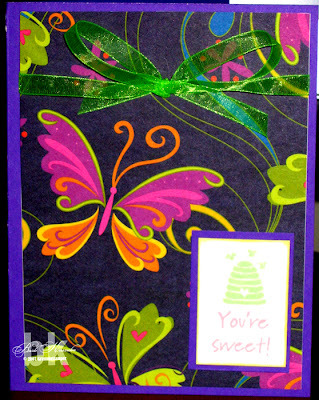 I used my Cuttlebug Happy Birthday embossing folder, then cut them into strips, added some ribbon and the stamped images and called it done! I can't say I'm lovin' the colours this week, but I do think the finished card looks okay. And, further than that, I truly believe that I haven't CASED these layouts, at least not that I am aware of. I really like sketch challenges and was starting to think I'd always have to depend on someone else's design. Maybe not, perhaps there's hope for me yet! LOL! 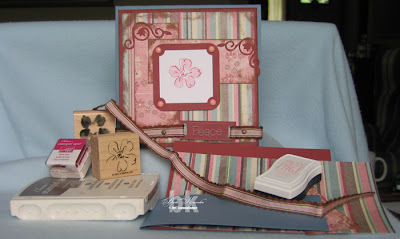 Accessories: Karen Foster Snap Stamps, Karen Foster Retro Resins Alphabet, Offray ribbon. 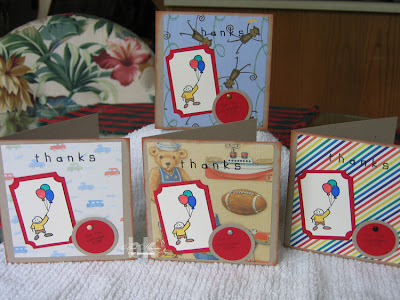 A few days ago, Allison of Stampin' When I Can posted a blog candy for surpassing the 150K mark. Well, guess who won. Yes, lil' (not true) ol' (true) me! This is the first time I've won anything since I was 10 years old and entered a draw for a German Shepherd puppy named Suzy. The puppy was with us a couple of weeks when my parents had to go out of town to attend a funeral. While they were gone, my sister who was a meany back then and 12 years older than me, gave Suzy away without telling me. I've been scarred ever since. Today, that hurt has been healed! Okay, so I'm being a little bit melodramatic, but what the hey, it's my blog. Thank you so much, Allison for such a generous prize of a $50 gift certificate to Scrappin' Great Deals. I have been a customer of Sheila's for a couple of months now and will look forward to shopping there again. Her service is fast, ladies, and she ships worldwide so don't be afraid to order from her. 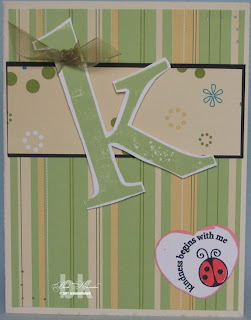 Do you remember the days, not so long ago, when monogram cards were the hot topic for swaps. Well, this was one of my first attempts. OH MY GOODNESS (had to spell this one out in full for emphasis). As you can see, it's all crumpled up. That's because it was in the bottom of the box that holds my creations. In my opinion, it should have stayed there, never to see the light of day again. Yes, at one time I considered this card a creation! Can you believe it? Thank goodness those days are OVER! 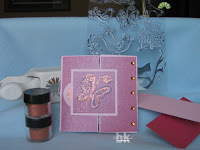 The makeover card uses the letter "k". Being the good Mom that I am, when I bought monograms, I chose to buy my DDs initials, rather than my own, so I couldn't re-create it with the same monogram. The stamps are from CTMH and the paper is SU. I added a little sheer ribbon and paper pierced the corners. I would be happy to send this one to my daughter, Kirsten. The good news is that the B card (as in B movie) never saw the light of day until I picked it from the bottom of the box. I don't even think it will go back there, it may just find a suitable corner of my circular file. Thanks for dropping by, it's always good to see a friend. FS17 ~ And She'll Have FUN, FUN, FUN! OMG! 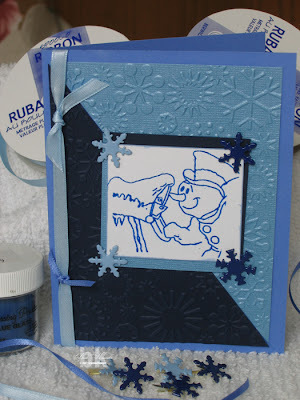 The Featured Stamper today is "stamps4funinCA" aka Tosha. I hadn't seen her gallery before, but I'm sure I'll be back to case more of her cards. The attention Tosha gives to the details is absolutely amazing. You can see her gallery here. What I find most interesting about challenges, whether it be on SCS or another blog, is that they have helped me so much in how I make my cards. For example, today I learned more about distressing the edges than I ever knew before, and I've been distressing edges for about a year now. I've learned how to take a card and break it down so that I can work out how it was put together and try to emulate it. I don't think I'll ever be a genius at "designing" my own cards, but being able to look at another artist's cards and try to re-create their style, while trying to make it my own in some way, will add so much to my work. To all those artists, I say "thank you". The card I chose to CASE is this one. 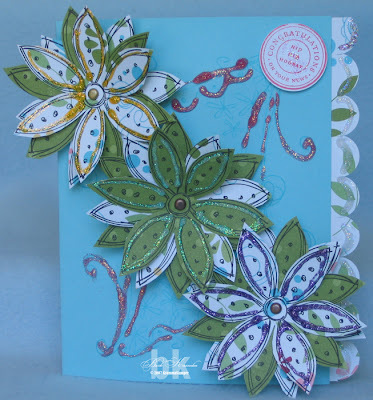 This lovely Bella card was made for the sketch challenge over at fresh and fun. I created my own sentiment using my new Karen Foster Snap Stamps. Beate, I love your challenges and I, for one, will appreciate easy sketches for the next few weeks. I hope you have a wonderful vacation and come back totally refreshed, although from personal experience, I often require a rest when I get home. My DH and I went to Germany in 1999 so that I could meet his relatives and I loved it. His family is from Wilhelmshaven in Northern Germany. We got to eat smoked eel and drink Jever beer. Mmmm, Mmmmm good! Then we toured the entire country, popped into Austria, France and Switzerland. I just loved it, I can't say it more clearly than that. This card is for two challenges. The first challenge is to make a Bella card using this sketch at Tracy's Happy Place. I just loved this layout and well, who doesn't like a Bella card? BTW, it is a sketch challenge originally from SCS. It's like two for the price of one! 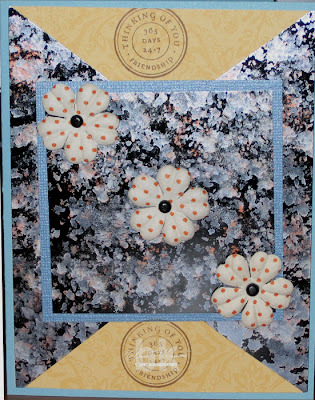 For the Inspiration Challenge, IC78 - Plate, over at SCS, this is my card. 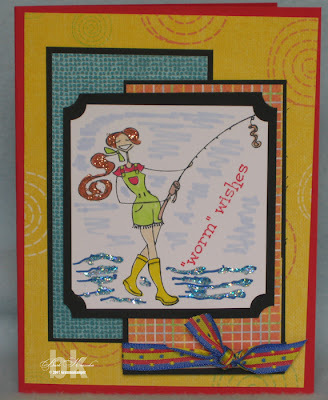 Another Bella card, this time with Staceyfishabella and her "worm" wishes! I've had her for three weeks now and this is the first time she's seen ink. And, of course, all Bellas need 'bling' so she's obviously just been to the hairstylist and had a few copper highlights put in her 'do'. You know, with that little worm on the hook, I thought I was going to have to ask DH to colour that little guy for me! Yucky worms. I can't decide is she is fishing for worms, compliments or the proverbial "other fish in the sea"! She's having fun though, I'm sure.